Edition: Limited edition 3/15, pencil signed at lower right. 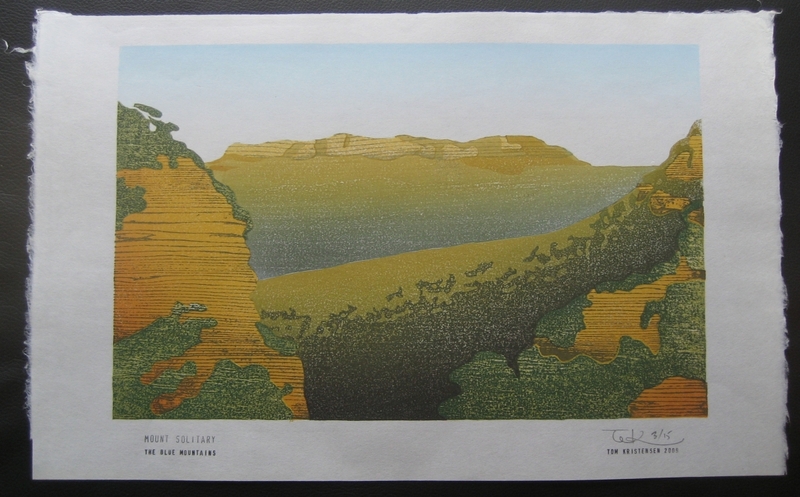 Description: Woodblock print showing Mount Solitary in the Blue Mountains west of Sydney (Australia). The printed image is 13 1/2" x 8 1/2" and the sheet size is 17 1/4" x 10 3/4". The following description has generously been provided by Tom Kristensen. The Mount Solitary print was an unusual project for me, I made it as a pair to the Three Sisters. I didn't have a lot of paper - its a particularly fine Iwano Ichibei washi - so I closed the edition at 15 prints with a few AP copies. The AP copies are nice enough copies, but they will have a speck somewhere that I didn't think passable. Sometimes I look at these copies later and think I have been too hard on myself. Normally I make too many prints, this time I made too few. With my prints I make them all in one sitting which usually takes a few days to a week including the proofing stage where colours and techniques are settled. While I do keep the blocks I am not likely to reprint from them, and if I did I would make a distinctly different print. 1 pine block for the foliage texture, 1 impression - these two blocks are sandblasted to bring out the grain. Where a bokashi is used I sometimes do an impression early and then use the rest of the block to over-print. If the end result needs a little more power, I will lay down another bokashi impression. This has the advantage of leaving wet areas of the paper to dry a little before reprinting. I can't claim to know exactly how many impressions there are, but we could say 12 and not be far off. As you will have noticed i have made extensive use of goma-zuri to keep an open texture that feels more like foliage. Bokashi is a colour gradation of a single color by hand applying a gradation of ink to a moistened wooden printing block, rather than inking the block uniformly. Goma-zuri is a sesame seed (speckled) pattern. If your interested in seeing more of Tom's work please visit Katoomba Fine Art Gallery and Saru Gallery.